With the increasing awareness of digital marketing, there have been endless possibilities and digital marketing strategies for your business. The first and foremost thing that strikes you for business marketing is ‘online or digital’. Though most of us use digital mediums knowingly or unknowingly many are still unaware of it. To put it in simple words, digital marketing is marketing over the internet with the help of various digital tools and digital marketing process is an effective method that helps digital marketing for your business. The primary step is to develop an effective marketing strategy by defining your goals both long-term and short-term. Look up for the challenges that come your way and tackle them effectively. Know your target audience, their interests, needs, wants and demographics. Have a clear picture about your product and how will it benefit the audience. The result of this sum leads to an insight which is the key to any marketing concept and can be merged with the strategy. An effective brand identity is the key to online marketing. Ensure your brand is not just a logo, make it impressive and powerful such that it speaks for itself. Create a powerful website with a clear and effective brand messaging. Keep it simple, user friendly, and engaging so that the visitor stay for longer on the page. Give the visitor what it wants with easy navigation and mobile-responsive websites. Social media integration- which has an active engagement of audience as 2/3rd of the audience is present on social media platforms. SEO & PPC- building high-quality links with relevant keywords in relation to product and service with a proper marketing campaign helps attain qualified leads at low rates. Effective CTA’s and relevant offers help in great way to encourage engagement and buying decision of the customer. You might create several landing pages to boost your sale, however only few works effectively which helps segment your leads with a better target interest of your audience. The client who feels satisfied with the service is likely to convert. Keep the track of your leads converted and client information which further help you nurture your relationship. It can be done through email marketing as well. Digital marketing strategy keeps changing and evolving with the time. however, it is very important to track and measure the amount that you spend for your campaign online. You can calculate the ROI compare, review and find out which channels perform better and do not perform to make investments accordingly for the next time. Retention is retaining your customers and get them back to your website to sell them your products again. This can be done through email marketing. 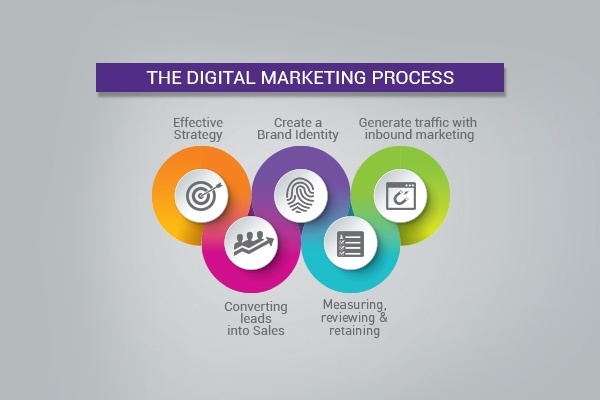 These steps of digital marketing process are surely going to help you target and engage your potential customers as well as retained customers and convert them into leads and sales further.